It may seem odd to want to control privacy on a social network like LinkedIn, especially when your goal is to be known and promote your career or home business. However, there may be situations when you want to limit the information shared particularly outside the network. One positive aspect of social media is that your information can be found through Google searches. But maybe you don't want that. Or maybe you only want people you're connected with on LinkedIn to see your full profile, while keeping it hidden from others. LinkedIn makes controlling and protecting your privacy relatively simple when compared to other social networking sites like Facebook. While those you connect with will be able to see your complete LinkedIn profile, you have considerable control over what portions of your profile are displayed to the public (people outside the network or through search engines). Why Limit Access to Your Profile? You're moonlighting your home business and you don't want your boss to know. You want to avoid a former boss from finding you and posting a bad reference. Your goal in using LinkedIn is more for support and resources, not for business building and marketing. You can control what people can and cannot see, or be alerted to on your Linkedin profile. Click on "Me" in the top right hand corner to see the drop-down menu. The click on "Settings & Privacy." Click on "Edit your public profile." According to LinkedIn, if your profile has been visible, it might take a few weeks for it drop out of search engines. Click on "Me" in the top right hand corner to see the drop-down menu. Then click on "Settings & Privacy." Go back to the area marked "Your profile's public visibility." You will see a series of categories (including your headline, websites, posts, summary, current and past experience, and education) that you can make public or private. If the item is visible, it will be marked "Show" and the button will be blue. To turn it off, click on the button to hide it. The button will turn gray. To see what your profile now looks like to the public, click "View My Public Profile" as others see it link. You can also customize who sees your profile photo—your connections, your network, all LinkedIn members or the public through search engines. Remember, the controls offered here are designed to limit access to people who are not a part of the LinkedIn community. 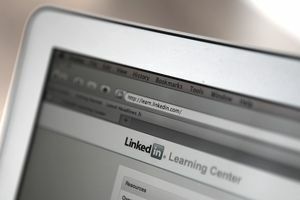 Your connections and other LinkedIn members will be privy to information you provide.